I seem to be going back and forth between Italy and Sweden these days, watching the Irene Huss TV series, continuing to catch up with the Commissario Trotti series by Timothy Williams, with new books by Åke Edwardsson, Conor Fitzgerald (Dogs of Rome), Mari Jungstedt, and Massimo Carlotto waiting impatiently on my table (a little excursion to Ireland possibly, in addition to the Conor Fitzgerald homeland, since I have a copy of the newest "Benjamin Black" from the library). 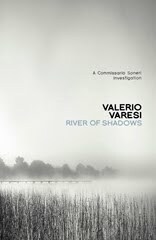 I've just finished Valerio Varesi's River of Shadows, set in Parma and the Po Valley and featuring Commissario Soneri. 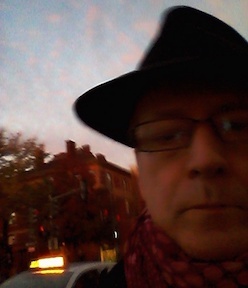 The book's first chapter is a bravado piece of writing set in a boatmen's club along the Po during an impending flood. Amid the conversation among the boatmen, a barge docks and then drifts away, and as the barge flows downstream they get intermittent radio reports on its seemingly unguided trip downriver, as it collides with a bridge and then runs aground. The chapter reads almost like a play, with the action restricted to the clubhouse and its immediate surroundings and the action reported in conversations and radio reports. With the second chapter, we meet Commissario Soneri, a detective who's not fond of new technology (even cellphones, much less computers) and who tends to abuse his coworkers with his sometimes contradictory instructions, delivered frequently by telephone as he wanders around his domain not so much investigating as absorbing the environment. Most of the policemen are sketched in effectively but not in depth, with the exception of the long-suffering forensics specialist and a melancholy maresciallo of the Carabinieri. The boatmen in fact take up most of the space of the story, as Soneri spends a lot of time among them, asking questions or just listening and watching. One of the most lively characters is Soneri's girlfriend Angela, who's quick to be angered by Soneri's thoughtlessness and to be excited by risky sites for sexual encounters. Soneri's investigation concerns an old man who fell (or was pushed) out of a hospital window and his brother, the captain of the runaway barge. Along the way, we learn a lot about the river and the towns along its banks, about the food and wine in the bars near the boatmen's hangout, and about the history and politics of the area (particularly the lingering effects of partisan/fascist conflicts at the end of Mussolini's reign and about the later history of the Communist Party in Italy (also a factor in the Trotti novels). River of Shadows, though, is not a book of facts but of impressions and emotions, which are as murky as the mists along the river. Soneri discovers some of what has been going on but can prove little of it, and seems to make his discoveries not by logical reasoning but by sensory impressions of the people and the setting. He travels back and forth between Parma and Torricelli (the town where the boatmen live) and to some mysterious places along the way (including a ghost town submerged in the river after the war). The solution to the crime is also more effective in its emotional truth than in a solution to a puzzle. Varesi's book is notable for its difference in style and tone from the other Italian mysteries that have been translated (and indeed from English and American crime fiction). Though some readers may be frustrated by the repetition inherent in Soneri's constant trips along a limited path and his return over and again to a small group of terse watermen, those who persist will be rewarded by a story that achieves more than the sum of its parts. I'll be very interested to see more of the series, to experience how Varesi's style changes (or not) when the river mists are less of a metaphorical and physical presence. And to see what Angela comes up with next, too. Translated by Joseph Farrell and published by MacLehose Press. Excellent review. I think you have captured perfectly the essences of this book - and its particular niche. I really enjoyed your review (having read the book recently, I enjoyed your insights all the more). Am reading and enjoying the book at the moment! Is the tv series available on DVD with English subtitles?